I am often asked for references on complementary medicine options for pets. Listed below are links to articles and podcasts on my blog that you might find helpful. I have also listed websites and FaceBook pages that you might wish to peruse. These are all based on my personal experiences with complementary veterinary providers I have used with my pets. Disclaimer – The information presented in this list is for educational purposes only. It is not a substitute for a medical or veterinary diagnosis by an appropriately credentialed and/or licensed professional. Complementary medicine should not necessarily be viewed as Do-It-Yourself medicine or as a low-cost alternative to traditional medicine. Many of these non-traditional medical systems are quite complicated, and it is in your pet’s best interest to seek help from a qualified and credentialed professional. How does homeopathy differ from traditional allopathic medicine? What is the difference between acute and chronic disease? What typically happens at a pet’s first appointment with Dr. Herman? I am often asked by clients how and why I became interested in holistic pet care. It was not a sudden revelation for me but has been a journey of many steps. Holistic is a term that is thrown around a great deal, and often people attribute its meaning to be natural, healthy, or “good for you.” Merriam-Webster defines “holistic as – “relating to or concerned with complete systems rather than with individual parts. relating to or concerned with wholes or with complete systems rather than with the analysis of, treatment of, or dissection into parts <holistic medicine attempts to treat both the mind and the body> <holistic ecology views humans and the environment as a single system>.” Holistic simply means that we consider the whole individual organism and the environment where it lives. Complicated, but also pretty basic. journey. Before he was a year old, he was suffering from chronic urinary tract infections (UTIs) which his veterinarian felt was related to an unidentified nutritional imbalance. That led to our striving to continually learn about pet nutrition to find a food that would cure Gus’ condition. It was a long journey that involved many different foods, fed singly and in combination, and even homemade diets formulated from recipes in Dr. Pitcairn’s Complete Guide to Natural Health for Dogs & Cats. Gus’ UTIs finally stopped when we switched to a dog food made by Wysong which we fed in conjunction with specific supplements for his condition. We learned more about pet food and a holistic approach to wellness from Dr. Wysong, which eventually led us to start to explore raw diets for pets. Paula and I attended our first seminar on raw diets for pets in 1998, started feeding raw to our dogs for at least one meal per day in 2000, and were selling raw diets at Green Acres by 2001. We continue to learn more about nutrition every year and have been feeding 100% raw for several years. 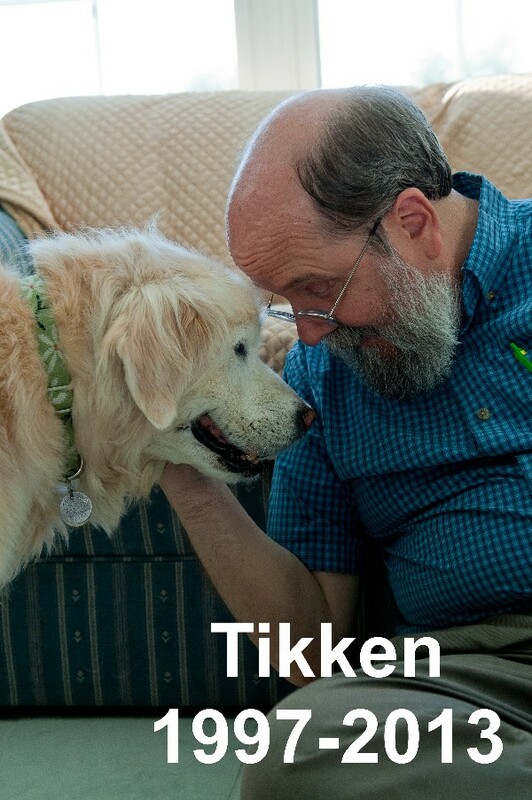 We credit a raw diet to our Golden, Tikken, living for 16 years. Appropriate nutrition is part of a holistic lifestyle, but it is not everything. Gus started having seizures, and when conventional medicine had done all it could to control the seizures, Paula started looking at other alternative treatments. 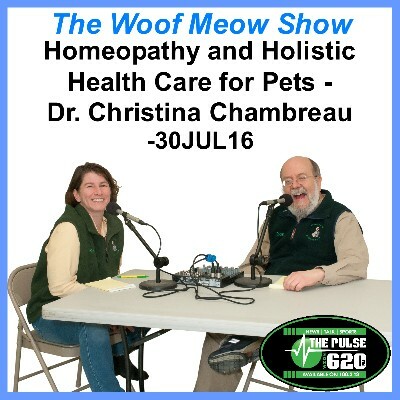 She had read about homeopathy in Dr. Pitcairn’s Complete Guide to Natural Health for Dogs & Cats, attended a seminar, and soon Gus’ was being treated homeopathically for epilepsy. About a year later Paula enrolled us both in a four-day seminar on veterinary homeopathy being taught by Dr. Charles Loops. It would be fair to say that I went along kicking and screaming. Before moving to Maine to purchase Green Acres, I had a seventeen-year career in the medical device industry in a variety of managerial positions. I was trained in and believed in traditional, modern medicine. It had been my livelihood. Since homeopathy challenged some very fundamental scientific principles, I felt it was “quackery” on a grand scale. Less than three hours into the seminar I was convinced that there was something to homeopathy, and it was far from quackery. 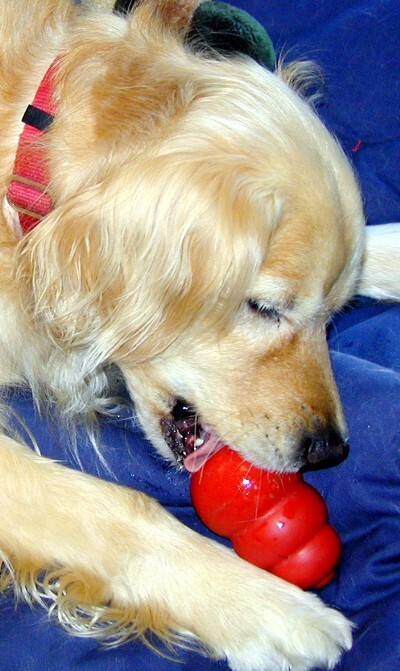 However, what convinced me most was how homeopathy cured my Golden Retriever when traditional medicine could not1. Don and Kate interview Dr. Christina Chambreau from Sparks, Maryland. Dr. Chambreau has been practicing veterinary medicine since 1980 and started using homeopathy in 1983, and with Dr. Richard Pitcairn, and Dr. Jana Rygas, was one of the founders of the Academy Of Veterinary Homeopathy in 1995. You can hear The Woof Meow Show on The Pulse AM620, WZON, and WKIT HD3 at 9 AM on Saturday. If you are not near a radio, listen on your computer at http://www.wzonthepulse.com or your smartphone or tablet with the free WZON 620 AM app. A podcast of the show is typically posted immediately after the show, and can be downloaded at www.woofmeowshow.com and the Apple iTunes store. 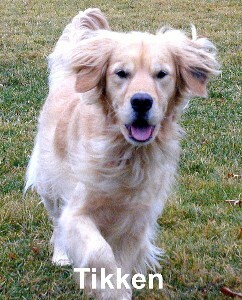 In April of 2000, our Golden retriever Tikken went to her veterinarian for her annual examination and received a two-year rabies booster. At the time, Maine law required a rabies vaccination every two years even though the vaccine was labeled as effective for three years. It was in July of 2000, when my sweet, cuddly Golden Retriever suddenly, and without warning or provocation, transformed from Tikken to Cujo, just like Dr. Jekyll turned into Mr. Hyde. One moment all of our dogs were lying calmly on the floor as my wife Paula watched television. Suddenly Tikken just exploded and within seconds she had ravaged Crystal, our Pekinese, causing the loss of Crystal’s left eye. While we had seen a few small signs of “irritability” in Tikken over the past couple of months, the apparently unprovoked nature of this attack, and its severity, led us straight to our veterinarian for a thorough check-up, including a complete thyroid panel and behavioral assessment. Her thyroid was abnormal, but not in a manner which suggested the need for medical treatment. However, based on the advice of the veterinarian, we started Tikken on a course of Clomipramine. We also began a strict management protocol with the dogs. 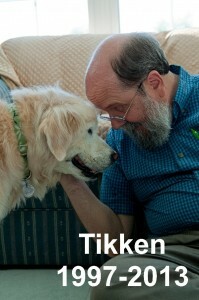 Unless we were present Tikken was separated from all but one of our older dogs, Shed. Tikken and Shed had bonded closely when Tikken was a puppy, she was always very respectful of Shed, and they were similar in size. We noticed increasingly anxious behaviors by Tikken. Now she became overly excited at mealtime, and became enraptured by any shadows or moving lights. These behaviors became so obsessive that I could not even distract her with fresh meat when she got caught up in a shadow or flickering light. Seeing no improvement in Tikken’s behavior, our veterinarian recommended a consultation with Dr. Dodman at the behavioral clinic at Tufts University. They recommended we put Tikken on a higher dose of Clomipramine, establish and maintain a dominance hierarchy, manage her environment, and institute a Nothing In Life Is Free (NILIF) program. We were already managing and doing NILIF and I had concerns about the validity of the hierarchical approach, so we were really hoping for the Clomipramine to work. What we ended up with was a dog that was so doped up that she seldom moved. She still became excited at mealtime and got caught up with shadows and light. She just moved slower. To us she seemed to have lost her will to do anything but lie around. six months of the higher dose of Clomipramine, we contacted Dr. Patricia McConnell, a behaviorist we had previously worked with when we were in Wisconsin, for another opinion. After reviewing Tikken’s history, Trish advised us that she had not had much success with dogs exhibiting Tikken’s issues using behavior modification, drugs or a combination of both. She did however indicate she had heard of some successes when treating with homeopathy. We immediately made an appointment with our homeopathic veterinarian, Dr. Judy Herman at the Animal Wellness Center in Augusta. Dr. Herman diagnosed Tikken with rabies miasm. A miasm is when the body/mind/emotions of an individual manifest signs of the disease without actually having the disease. Tikken was given a homeopathic remedy at the conclusion of the consultation and within eight weeks she was weaned off Clomipramine entirely. We were soon seeing dramatic improvements in her symptoms. Tikken was treated two other times with the same homeopathic remedy over the next few months. 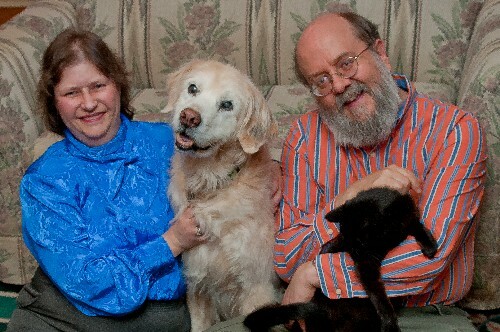 We still managed the dogs closely, but Tikken eventually became reintegrated with the rest of the pets in the household. 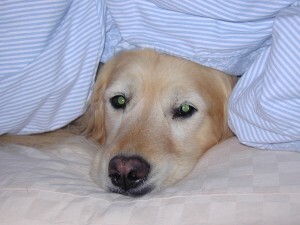 Homeopathy gave us our sweet, cuddly Golden back. Since Dr. Herman felt that Tikken’s issues were the result of a reaction to her rabies vaccine we evaluated our vaccination protocols with all of the dogs. We have been doing titer tests in lieu of vaccinations since that time, with the exception of the rabies vaccine. Tikken did receive two subsequent rabies vaccines under the guidance of Dr. Herman, followed by treatment homeopathically. When she developed a second immune mediated disorder (pigmentary uveitis) in 2004, we decided to stop any further rabies vaccines, and she now has a medical exemption which still allows her to be licensed. Paula and I both started to read more about vaccines and become further educated about alternatives. We made the decision to allow our clients to also do titer tests in lieu of vaccines, as long as the tests were done under the direction of a veterinarian. Rethinking Annual Vaccinations for the Green Acres newsletter. In this article I disclosed that as early as 1992 veterinary textbooks were questioning annual vaccinations (Current Veterinary Therapy, volume XI, pp202-206: “A practice that was started many years ago and that lacks scientific validity or verification is annual revaccination. Almost without exception there is no immunological requirement for annual revaccination. Immunity to viruses persists for years in the life of the animal.” – Dr. Ronald Schultz, Veterinary Immunologist. In this article, I suggested that minimally clients talk with their veterinarian and ask if titer tests were an option. Needless to say, several veterinarians in our service area were not too happy with me, but I still believe I did the right thing. I felt somewhat vindicated a year later when the American Animal Hospital Association published their new vaccination guidelines which started a move away from annual vaccination. We were very fortunate that Tikken overcame her rabies miasm and remained with us until she crossed the crossed the Rainbow Bridge on February 7th, 2013 at the age of 16 years and 27 days. It was several months after her treatment with homeopathy before we fully reintegrated Tikken with the rest of our pets; however, she lived the remainder of her life in complete harmony with them and even became buddies with Batman, a rescued cat that joined our family. Tikken did require ongoing treatment for her pigmentary uveitis and eventually also required treatment for hypothyroidism for the rest of her life. We are convinced that homeopathy, tittering instead of regular vaccination, and a raw diet contributed to Tikken’s long life. Vaccines are incredibly important in preventing infectious diseases in both animals and people. However, they can also cause life threatening adverse reactions. This interview discussed the importance of vaccines and how to use them in the safest manner possible. I first learned of Dr. Ron Schultz sometime between the spring of 2000 and the spring of 2002. Paula and I had started reading everything we could about vaccinations, especially adverse reactions due to over vaccination, because our Golden Retriever Tikken had started exhibiting some severe behavioral changes in the spring of 2000. Her aggression towards other dogs and subsequent obsessive-compulsive shadow and light chasing began shortly after her third Rabies vaccination. Her first Rabies vaccination was in 1997 when she was a puppy. Her second occurred when she was one year old in 1998 and the third occurred in 2000. At the time Maine law required revaccination for Rabies every two years, even though the Rabies vaccine was labeled as offering immunity for three years. We were not initially aware that Tikken’s behavioral changes were a result of a vaccine reaction. We consulted with our local veterinarian who provided treatment and then the veterinary behavior clinic at Tufts University when we saw no improvement. 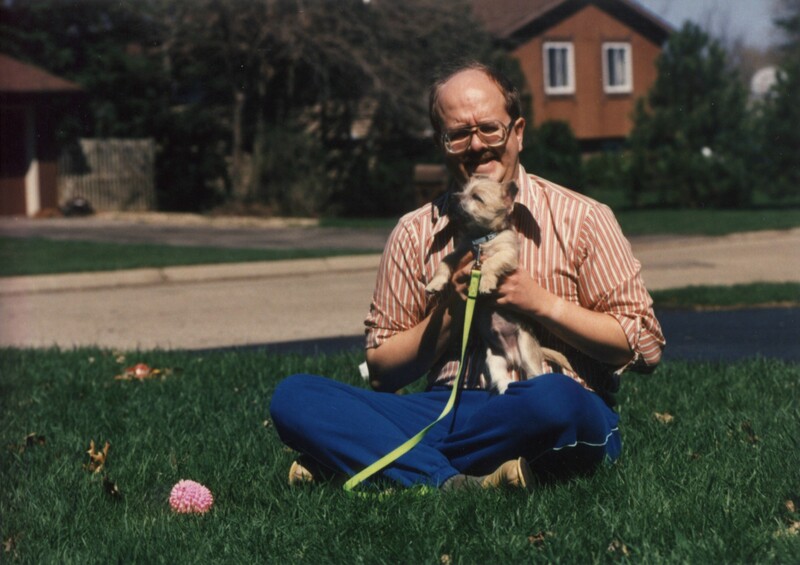 When there was still no improvement we consulted with an applied animal behaviorist in Wisconsin who suggested we explore a homeopathic treatment for Tikken’s disease. In the spring of 2001 Tikken was examined by Dr. Judy Herman of the Animal Wellness Center in Augusta, ME and diagnosed as having had a reaction to the Rabies vaccine. She was subsequently treated and cured for a Rabies miasm by Dr. Herman. As a result of Tikken’s illness, Paula and I started educating ourselves about vaccines and I came upon the following quote, by Dr. Schultz, from a veterinary text book. A practice that was started many years ago and that lacks scientific validity or verification is annual revaccination. Almost without exception there is no immunologic requirement for annual revaccination. Immunity to viruses persists for years in the life of the animal. – Veterinary immunologist Ronald Schultz and Tom Phillips make the following statement in Current Veterinary Therapy, volume XI, pp202-206, 1992. It was apparent that experts in the field felt that the annual vaccination of our pets was not necessary. Knowing the types of reactions that vaccinations could cause, we continued to learn everything we could about vaccines. We also started to share that information with our clients at Green Acres Kennel Shop when I wrote the article Rethinking Annual Vaccinations for our April 2002 newsletter, Paw Prints. 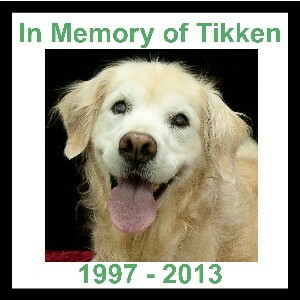 On February 7th, 2013 Tikken crossed the rainbow bridge at 16 years of age. 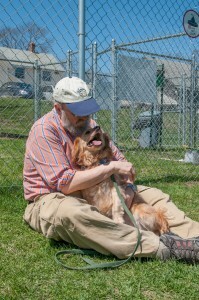 While she had mostly recovered from the behavioral issues resulting from her adverse reaction to the Rabies vaccine, she was never the same confident, anxiety free dog that she was pre-reaction. Her veterinarians have advised us that the two immune mediated diseases (hypothyroid disease and golden retriever uveitis syndrome) she later developed were also probably related to the Rabies vacation and her genetics. The vaccine triggered an abnormal immune response which affected these other organ systems. Upon Tikken’s passing Paula and I were looking for an appropriate way to remember her and decided to commit to educating others by sharing Tikken’s story and to do a fundraiser for The Rabies Challenge Fund (http://www.rabieschallengefund.org/ and https://www.facebook.com/pages/The-Rabies-Challenge-Fund/119106981159?fref=ts). This interview and the four resulting Woof Meow Shows with Dr. Schultz are part of that educational effort. The following are notes, not a transcript, from an interview with Dr. Ron Schultz, Professor and Chair of the Department of Pathobiological Sciences at the School of Veterinary Medicine at the University of Wisconsin-Madison. 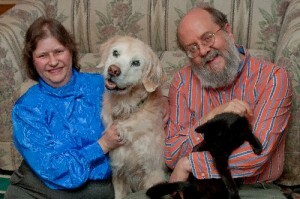 Dr. Schultz is considered to be one of the foremost experts on immunology and vaccinations for pets. The interview occurred on Friday, May 3rd 2013 and was broadcast as four separate editions of The Woof Meow Show on the Voice of Maine WVOM, 103.9FM & WVQM 101.3FM on four subsequent weekends. Thanks to the generosity of 53 clients, friends and colleagues we were able to raise a total of $1240 with our fundraiser for The Rabies Challenge Fund from September 1st through October 5th. 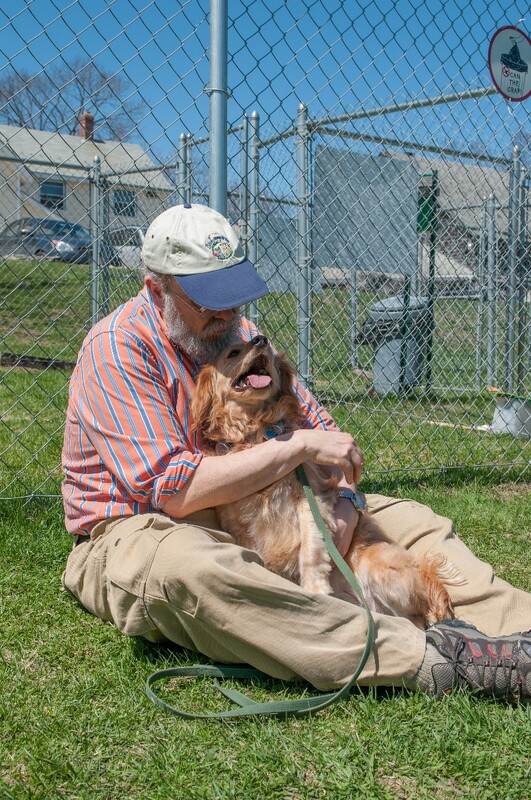 As promised we matched that generosity dollar for dollar and have sent a check to the Rabies Challenge Fund for $2,535 as a memoriam for our Golden Retriever, Tikken. Thank you to all of you that contributed; Ann Murray, Anonymous, Barbara Cyr, Becky Brimley, Belinda Doliber, Brent & Michele Slater, Carol Higgins Taylor and Juanita Taylor, Carolyn Clark, Chris & Jane Flieller, Cindy Black, Coastside Bioresources, Colleen Pelar, Cynthia Bentley, Cynthia Farrell, Dee Hoult (Applause Your Paws), Doreen & Ken Dybevik, Gary & Deb Mickalowski, Ginger & David Ward-Green, Heidi Riggs, Helen Musselwhite, Jan & David Pilotte, Jen Shryock (Family Paws), Jill Marple, John Hamer & Anne Marie Storey, Dr. Judith Herman, Julie Perkins, Juliette Humiston, Kathy Klein, Ken & Peggy Grant, Laura Van Dyne, Linda Mosely, Links Online Marketing, LLC (Kristy & Ken Kimball), Maina Fernald, Margaret Hall, Maria Staples, Marjorie Speck, Michael Puls, Michelle Sirois, Nanette Belenger, Patrick Lyons, Ralph Carr, Rhonda & Rick Hutchins, Richard & Cristanna Cook, Rick and Jill Marston, Sandra Payne, Sarah Baldwin, Sherry Pfister, Susan Scammon, Susan Witt, Teoti Anderson and Vanessa Field. Vaccines are important because they can prevent some very serious vaccine preventable diseases that can make animals very sick and can even kill. Since the veterinary profession started to reexamine vaccines in the 2000’s, they have come up with the term “core vaccines” to identify the vaccinations that all animals should have. These vaccines are so effective that they will prevent the disease in all appropriately vaccinated animals. According to Dr. Schultz, dogs should receive the following core vaccines Canine Distemper Virus (CDV), Canine Parvovirus (CPV-2), Canine Adenovirus-1 (Infectious Canine Hepatitis [ICH])/Canine Adenovirus-2 and Rabies Virus (RV). The latter is not only important for the dog, but because it is usually fatal and can be transmitted to humans, it is considered a public health issue. Dr. Schultz recommends that cats receive the following core vaccines; Feline Parvovirus (Panleukopenia) Virus (formerly known as feline distemper distemper)FPV, Feline Calicivirus (respiratory) (FCV), Feline Herpes Type 1 Virus (FHV-1), and Rabies Virus (RV). Since the late 1990’s there has been a big change in the recommendations for how often our pets should be vaccinated. For years vaccinations were given annually as part of a pet’s annual wellness exam. This changed with the eventual recognition that pets were being over vaccinated, which in turn in some cases was causing pets to become very ill or to even die. Dr. Schultz indicates that dogs should not receive any vaccinations before they are six weeks of age. This is because a puppy/kitten gets some immunity through antibodies in their mother’s milk. Those antibodies help protect the puppy/kitten from disease but also will interfere with vaccinations. This is why puppies and kittens receive multiple vaccinations. Although the antibodies in the milk interfere with vaccinations, under no circumstances should you prevent the puppy/kitten from getting these antibodies. Recommended vaccination schedule: Start at 8-10 weeks, give a second dose 3 to 4 weeks later and then a final dose an additional 3 to 4 weeks later, making sure it is at 14 to 16 weeks of age. By then the mother’s antibodies will not interfere with the vaccinations. After these initial puppy/kitten vaccinations, Dr. Schultz recommends doing a titer test or revaccination when the puppy/kitten is a year of age and then revaccinating or re-titering no more frequently than every 3 years. Some breeds (Rottweiler’s and Doberman’s) do not develop an immune response as easily, especially to the canine parvo vaccine. However, studies have demonstrated that if that last dose is at 14-16 weeks of age at least 98% of puppies will get immunized, regardless of breed. What Determines How Long A Vaccine is Effective? It’s the specific vaccine and the disease it was designed to prevent that determines how long it will confer immunity. All of the core vaccines, except Rabies, are modified live vaccines. This means that they actually must infect the animal in order to have an immunization effect and therefore must contain an attenuated version of the actual virus. The immunity that is conferred by this type of vaccine, just like the core vaccines for children (measles, mumps rubella), provide long term immunity because they are live, replicating viruses, much like the immunity one would get if one were actually infected with and recovered from those diseases. Immunity conferred by these vaccines is typically many years to a lifetime. If you get measles or are vaccinated for measles as a child you will not get it again anytime in your life, even if you are exposed. That is the same with distemper, parvo, and the other core animal vaccines. That’s why back in the 1970’s Dr. Schultz and others started questioning the need for annual revaccinations of our pets. In other words, for the core vaccines that include a modified live virus, once a pet has had their puppy series and their revaccination at one year of age, they should be immune for life and should NOT require further vaccination. This is why instead of revaccinating annually Dr. Schultz recommends that we only consider revaccination every three or more years. His personal preference is to do titer testing every three years. A disadvantage of titers is they can be more expensive than revaccinating, but it is much safer to do a titer because while the adverse reactions to vaccines are fairly small they still can occur. Plus it’s just not good medical practice to give a vaccine that’s not needed. Titers can be done for Rabies but due to legal and public health requirements, revaccination for Rabies is still required every three years. Those legal requirements don’t necessarily follow science or good vaccination practice, but they are the law of the land. All states in the US now have a three year Rabies vaccination law. The initial Rabies vaccination should not occur before 12 weeks of age. The second vaccination should occur a year later and any subsequent revaccination for Rabies should not occur more often than every three years. If you travel internationally with your dog, other laws may apply. I had a friend who moved out of the USA and had to have her dog vaccinated for Rabies three times in a few months in order to be admitted to the country where she moved. The dog later developed hyperthyroid disease which is a possible vaccine reaction. Antibody titer testing is a good alternative to revaccinating every three years and should be considered when you bring your pet in for an annual wellness exam. An annual wellness exam is a very important part of any pet’s ongoing veterinary care. Additionally, some of the non-core vaccines must be given on an annual basis because they are only effective for a year. Dr. Schultz recommends titers for Canine Distemper Virus (CDV) and Canine Parvovirus (CPV-2). Titers are generally not needed for Canine Adenovirus-1 (Infectious Canine Hepatitis [ICH])/Canine Adenovirus-2) if you get positive results for distemper and parvo. Titers don’t need to be done more often than every three years. Unfortunately there is confusion in the veterinary community as to how to use and interpret a titer test. A common misunderstanding about titering is that it is only a snapshot that indicates an animal’s immunity at a specific moment in time and that it does not indicate if your pet will still be immune in three months. Dr. Schultz indicates that is not the case at all. With regard to Distemper, Parvo and Adeno, a positive titer indicates immunity for life unless the animal contracts a severe disease that suppresses their immune system. Non-core vaccines are not necessary for many animals and are only recommended when an animal as at risk of contracting the disease due to lifestyle and or where they live. Dr. Schultz believes the most important non-core vaccine for the dog is the one for kennel cough or more correctly called Canine Infectious Respiratory Disease Complex (CIRDC). This is a complex disease that involves a number of bacteria and viruses which can cause this disease. Bordetella bronchiseptica is the most prevalent of the bacteria that contribute to this disease. A variety of viruses can also contribute to this disease (Canine Parainfluenza, Canine Influenza virus, and several others). A variety of vaccines exist to reduce the severity of kennel cough. Other non-core vaccines for the dog that are important are Leptospirosis (caused by four different serovars/strains). The other disease that is regional for which there is a vaccine is Lyme disease. These non-core vaccines, unlike the core vaccines, only provide short-term immunity and must be given annually. Why don’t these vaccines confer long term immunity? It has to do with the immunity of the animal. There are some diseases, with humans too, where once we get the disease we develop a lifelong immunity. An example with this with humans would be measles. But with humans and animals there are also many diseases which we can get over and over again like Lyme disease and the common cold. Some of the human vaccines that only give short term immunity would be tetanus. Part of the reason dogs require more frequent vaccinations than humans is that they don’t live as long. Most boarding facilities, daycares and training classes require the canine cough vaccine, even though it’s not a core vaccine. Over the past 15 years the vaccines that are used for this complex group of diseases have changed, as well as the protocols for their administration. What in your opinion really works best? First we need to remember that canine cough/CIRDC is not vaccine preventable. The vaccines only reduce the severity of the disease. Part of that is because we don’t even have vaccines for some of the organisms that cause CIRDC. However, even where we do have vaccines, they are often only 60% to 70% effective. That’s why a dog can be vaccinated and still get CIRDC. For Bordetella, the most important bacterial component of canine cough, we now have an injectable vaccine which is made from a dead organism, an intranasal vaccine which is a modified live vaccine, and an oral vaccine which is made from a modified live organism. The two live vaccines are more effective than the dead vaccine. Dr. Schultz recommends revaccination on an annual basis and prefers the intranasal vaccine. It not only includes Bordetella but also canine Parainfluenza. Since the normal path of infection for these diseases is via the respiratory system, Dr. Schultz feels the intranasal approach is the best way to administer this vaccine. Both Bordetella and canine Parainfluenza can also be administered by injection, but Dr. Schultz indicates that neither work as well as the vaccine administered intra-nasally. Some dogs will develop a cough after being given the intranasal vaccine but it is not an infection but is actually an allergic reaction to the Bordetella component of the vaccine. These dogs have not developed canine cough but because they have a hyper sensitivity to the vaccine they are coughing. In cats there are very few non-core vaccines that are recommended. While Feline Leukemia has previously been recommended annually this has changed to every 2 to 3 years since the publication of the new guidelines. It is now only considered a core vaccine for all kittens because if we get a major part of the population of kittens vaccinated we could reduce or even eliminate Feline Leukemia virus as a cause of disease in the cat. It would require two doses given between 8 and 10 weeks of age and between 12 to 14 weeks of age. Dr. Schultz would recommend a third vaccine again at one year and then no further vaccines for FeLV. They have actually eradicated Feline Leukemia in Switzerland using this type of vaccine program with kittens. The Feline Immune Deficiency Virus vaccine is not recommended by Dr. Schultz. There is also a Feline Infectious Peritonitis vaccine that is available and most feline practitioners do not recommend this vaccine. A non-adjuvanted Rabies vaccine that requires annual revaccinations is also available for cats. In addition to the ingredients used to stimulate the immune response many vaccines contain an adjuvant, which is an additional ingredient designed to further stimulate the immune system. Unfortunately, this adjuvant is often the vaccine component which causes an adverse reaction, hence the development of this non-adjuvanted vaccine. This will probably become a three year vaccine in the near future. Injection site sarcomas, the development of a malignant tumor at a vaccine injection site was one of the reasons vaccines started to be looked at more critically. This was discovered in the mid 1980’s when these lethal tumors started showing up in cats. Vaccines do have the potential to cause harm, but for years the prevailing attitude was if a vaccine doesn’t help, it least it won’t hurt. Obviously this was not the case and people started to reexamine if their pets should be vaccinated so frequently, much less at all. In general vaccines are very safe. Less serious adverse reactions can include causing a change in pigmentation at the injection site. The injection site sarcoma was very much a species issue related specifically to the cat. Injection site tumors in the dog are very rare. All of these adverse reactions are determined by the genetics of the animal, not only the vaccine. When breeders observe these vaccination reactions in litters, they need to make sure that those animals producing these litters are not bred again. Doing so only perpetuates the genetics and increases the odds of an adverse reaction. Autoimmune diseases are genetically controlled but can be triggered by vaccinations. Immune mediated hypersensitivities like anaphylaxis have both a genetic and a vaccine component. Adverse reactions do not always occur the first time a vaccine is administered but can occur after subsequent vaccinations when the animal becomes hypersensitive. Certain vaccines are more likely to trigger this type of hypersensitivity. The Leptospirosis vaccine and the injectable Bordetella vaccine have caused hypersensitivity reactions. It’s often not the antigens in the vaccine, the substances that are meant to help the animal, that cause the reactions. Reactions are often caused by other ingredients in the vaccine like Bovine Serum Albumen, adjuvants, etc. By vaccinating only with the vaccines that are absolutely necessary and as infrequently as possible, we can minimize the risk of adverse reactions. There are many adverse reactions that can occur from a vaccination. Dr. Schultz has a list over a page long of potential vaccine reactions. Even behavioral changes can be the result of an adverse reaction because the immune system is closely integrated with both the nervous and endocrine system. This is why behavior can be affected by a vaccine. The only reactions that are considered to be caused by a vaccine are those that happen immediately, within 15 minutes to an hour after vaccination. There are other reactions that can happen days, weeks and even months later. 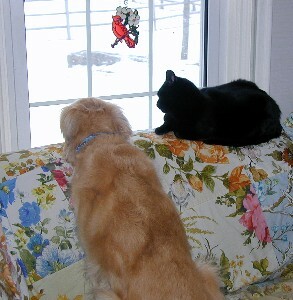 Our Golden Retriever Tikken had started exhibiting some severe behavioral changes in the spring of 2000. Her aggression towards other dogs and subsequent obsessive-compulsive shadow and light chasing began shortly after her third Rabies vaccination. Her first Rabies vaccination was in 1997 when she was a puppy. Her second occurred when she was one year old in 1998 and the third occurred in 2000. At the time Maine law required revaccination for Rabies every two years, even though the Rabies vaccine was labeled as offering immunity for three years. For more about Tikken, the Rabies vaccination and here treatment: <click here>. This is a project conceived by Kris Christine whose Labrador Retriever, Meadow, had an adverse reaction to a Rabies vaccine. Meadow developed a mast cell sarcoma at the injection site of the Rabies vaccination. Kris actually recruited Dr. Ron Schultz and another veterinarian, Dr. Jean Dodds, also very involved in vaccine work, to start a study to answer the question how long is the duration of immunity from today’s Rabies vaccine used with dogs? Current vaccines are labeled by the USDA as one year or three year vaccines. In some of these cases the vaccines are actually identical. Because Rabies is a disease that can affect humans in addition to animals it is regulated more strictly than other vaccines. The duration of immunity is actually determined by challenging previously immunized animals with exposure to the disease to see if they survive. No additional challenge tests have been done beyond three years. A goal of the Rabies Challenge Fund is to complete this study at the 5 year and 7 year points. The Rabies vaccine given today is a killed or non-infectious vaccine. Typically the duration of immunity for vaccines of this type is much shorter than the duration of immunity for modified live vaccines. For example a distemper killed vaccine provides immunity for about a year while a distemper vaccine made with modified live virus has a duration of immunity equal to the lifetime of the animal. Up until the mid-1980’s, the Rabies vaccine was made with a modified live virus and that vaccine likely would result in lifetime immunity. However, because a few cats that received that vaccine actually developed a Rabies infection after vaccination the USDA no longer allows this vaccine to be used in the US. It is unclear why these cats developed Rabies from the vaccine. It is quite possible that their immune systems were already compromised due to an infection of Feline Leukemia virus. The goal of the study being conducted by the Rabies Challenge Fund is to determine if the current killed vaccine will offer immunity up to five and seven years. A new advance in Rabies vaccines is the development of vaccines made with recombinant technology. A feline version of this Rabies vaccine already exists. It behaves like a live vaccine but it cannot actually infect an animal with Rabies. This technology has also been used with the Distemper vaccine for the dog. That vaccine gives as long a duration of immunity as a modified live virus vaccine, up to nine years, which is considered a lifetime. Since there is no live virus in the vaccine it is also safer. It is also safer because recombinant vaccines, unlike killed virus vaccines, do not require the addition of adjuvants to help increase the immune response. It is believed that the hypersensitivity reactions to vaccines may be in part caused by these adjuvants. The Rabies Challenge Fund is funded entirely by animal owners, not vaccine companies or any other company. The University of Wisconsin has been very generous in reducing the costs of the study since it is being funded by animal owners. Donations have come from individuals, dog clubs and others. The study is not over and fundraising is ongoing. If you are interested in helping fund this project you can find more information at (http://www.rabieschallengefund.org/). The Rabies Challenge Fund is not only doing research but has also done some very effective lobbying to change the laws in all 50 states so that dogs only need to be revaccinated for Rabies every three years. Prior to that effort, there were many states that required the Rabies vaccine annually.